After 14 amazing years at Microsoft, I am excited to announce that today I start my next chapter as Founder and CEO of The Learning Futures Group. I am immensely grateful for the opportunity I had to work at one of the world’s truly great companies, and especially through the last five years of an incredible maybe historic corporate transformation. Working on that beautiful Redmond campus Microsoft taught me so much - from the mechanics of running a channel Learning business, through countless hard-learned lessons in team and people leadership, to the importance of social responsibility and a collective value set to inspire and guide. Without question, the people at Microsoft are smart and driven, and sometimes things could get pretty pressure-cooker in there. But they also share a sense of clear purpose and mission to improve themselves and the world around them. For example, since our dynamic new CEO Satya Nadella came on board in 2014 - when the world had consigned Microsoft to the dustbin of the 'post PC era’ - I, along with other 110,000 colleagues, the absolute importance of a growth mindset, the value of learning through failure, the power of the word 'yet', the critical skill of approaching problems with curiosity and an open mind, and what listening carefully to others really gives you. It was a remarkable transformation. Engineers who had worked alone in small offices and shipped products on CD-ROM once every three years now found themselves working in teams, shipping features onto live systems used by millions of customers after two-week sprints. Sales teams who had deep relationships in IT Departments and who could articulate the features, functions, feeds and speeds and cost benefit of all manner of enterprise software packages now found themselves talking to line of business leaders more concerned about the urgent need for digital transformation and competitive threats to their business than navigating complex licensing terms. And perhaps hardest of all, managers and leaders had to discard old practices of performance calibration and stack ranking, and instead learn to embrace new leadership principles of creating clarity, energy and results. The work is not over for Microsoft in its shift from a Know-all to a Learn-all culture. But for the CLO community it has been my great fortune to open a dialog with these past few years, the significance of what Microsoft is undergoing is a practical example of a bold experiment to make a Learning Culture a competitive advantage. Thanks Microsoft and good luck in your Learning Future. But my Microsoft story has ended, and it’s time for a new narrative to start. What I propose to do is to take my own learnings of this experience - backed by all the other things I have learned in my career, like my amazing years at Oracle building global sales education structures, my own time as a software salesperson on the road, my decades of personal investment in reading, thinking, listening and learning to L&D leaders and influencers, my years at school - and take this into a new relationship: the Learning Futures Group, a new network I am setting up and launching November 2018. 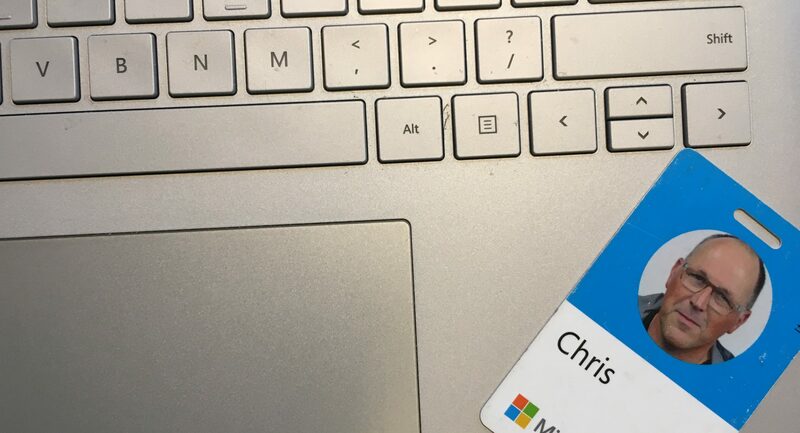 I’m so, so thankful for the time and learning and the great people I got to work with and learn from, at Microsoft but everywhere else along my journey… but I'm excited to start my next chapter, share what I've learned, exercise a whole bunch of different muscles, and learn some new stuff. With YOU. Together! I'm ready to work hard, have fun, and create some lasting value with the clients I know I’m going to love working with. And I really hope one of them is you. Congratulations Chris! This is an exciting, timely and thought provoking new venture – I wish you all the very best. Let’s hope that 2019 proves to be a wonderful year and that maybe we can get together to mull over ideas for the future.